That was the beginning of one of the most dramatic achievements in chemical research. The student was Charles Martin Hall. 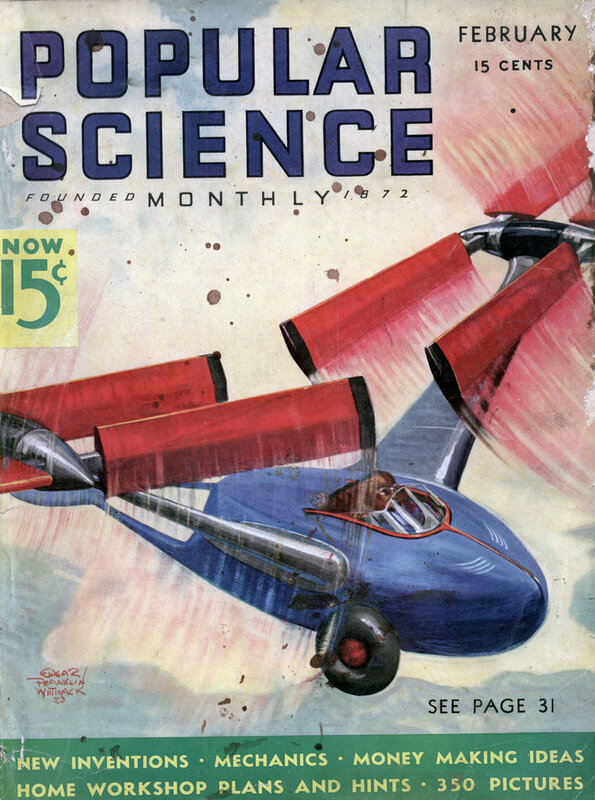 Hardly three years later, in a wood-shed workshop, using makeshift apparatus and homemade batteries, he achieved the goal which the greatest scientists in the world had failed to attain. On February 23, 1886, Hall rushed into Jewett’s laboratory with a few small buttons of silvery metal in his hand. It was the first aluminum produced by the method which now turns out the world’s supply of more than 375,000,000 pounds a year. Those buttons are still in existence. So fast has the world of aluminum moved, that few of the millions who take this metal for granted know its amazing history. Few realize that less than a century ago, platinum and aluminum jewelry sold for exactly the same price; that, at the Paris Exposition of 1855, a lump of aluminum occupied a place of honor next to the crown jewels; that in 1884, when the 100-ounce aluminum cap was cast for the Washington Monument, it was exhibited in the window of a Fifth Avenue jeweler, in New York City. Napoleon III entertained guests at a table set with aluminum forks. The King of Siam wore an aluminum watch fob. And, when the Prince Imperial of France was one year old, a minister of state bought him the rarest thing he could find, an aluminum rattle. In 1852, the metal was quoted at $545 a pound; today, it sells for about twenty cents a pound. The discovery made by the twenty-two-year-old student at Oberlin College is responsible. As it celebrates, this month, the fiftieth anniversary of his accomplishment, the world is depending in countless ways upon the metal he made commercially available. From the time you wake up and squeeze tooth paste from an aluminum tube in the morning, until you go to bed at night, you meet the silvery metal in a host of forms. Products range from rivets the size of a match head to fifty-ton cranes and giant Zeppelins. Racing yachts, chewing-gum wrappers, chairs, wheelbarrows, Hollywood armor, baby cradles, tank cars, horseshoes, beer kegs, bicycles, fishing reels, and tiger cages all have been made of aluminum. It is used in gleaming church spires, roaring airplanes, 100-mile-an-hour streamline trains. Engineers on the Mississippi use aluminum booms and buckets; workmen at Boulder Dam employ dump trucks with aluminum bodies. T.N.T. is mixed in aluminum vats. Snowshoes, whistling teakettles, golf clubs, and fireworks all depend upon the unique combination of qualities found in this magic metal. So many, so varied, so vital are the uses of aluminum that it is easy to forget that people still living have seen virtually its whole commercial history. 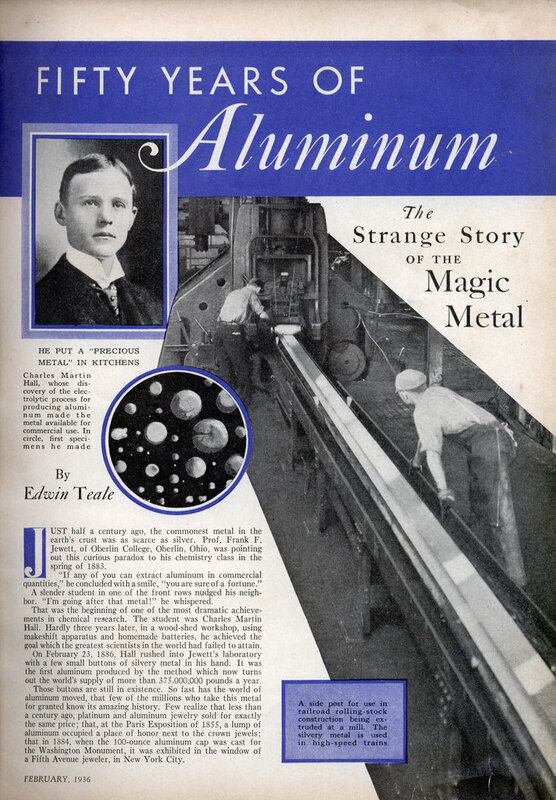 It is easy to forget that only 111 years ago, no one in the world had ever seen aluminum. The first man to set eyes upon the metal was the Danish experimenter, Hans Christian Oersted. In 1825, Oersted, by chemical methods, obtained small globules of aluminum no larger than a pinhead. Later, the German chemist, Friedrich Wohler, accomplished the same feat. But it was not until Napoleon III became interested in using the light metal for military helmets that Henri Sainte-Claire Deville was set to work producing usable quantities of aluminum. His chemical reduction method put the metal on the market, but large quantities and cheap production were impossible. At this point, encouraged by Prof. Jewett, Charles Martin Hall started his quest. Every spare minute went into his search for a short cut to the production of aluminum. After he graduated, he continued his researches, making his own batteries and assembling makeshift apparatus in a shed back of his home. Aluminum oxide, or alumina, was comparatively easy to obtain. It was reducing the oxide to the metal that had balked previous efforts to produce aluminum in commercial quantities. Hall sought to reach the goal by a new roadâ€”electrolysis, or the chemical decomposition of the alumina, while in the molten state, by an electric current. The melting point of alumina is 2,050 degrees C, far too high for Hall’s homemade bellows and furnace. So he sought a chemical salt which when molten would dissolve alumina and enable him to electrolyze it in solution. First he tried fluor spar. It proved unsatisfactory. Then he turned to magnesium fluoride. Again, the result was failure. Finally, he tried cryolite, a glassy substance brought from Greenland. Pumping the bellows in his shed laboratory, Hall melted the cryolite and sprinkled into it the snow-white, powdered alumina. Then, for two hours, he let an electric current pass through the seething mass. In the bottom of the crucible, when the test was ended, he found small globules of silvery metal. As soon as they were cool, he rushed out into the cold February day to show Prof. Jewett that his search had reached its goal. Curiously enough, 3,000 miles away at Gentilly, France, another young experimenter of Hall’s age had made the same discovery at almost the same time. He was Paul Heroult. Inheriting a small tannery, Heroult used the Gramme dynamo in it to provide electricity for his tests. The lives of these two workers ran strangely parallel. They both were born in 1863. They both made their discovery in 1886. And they both died in the same year, 1914. Hall’s success preceded Heroult’s by a scant two months. Theoretically, every clay bank is an aluminum mine. In practice, however, an ore, named bauxite, after the French village of Les Baux where it was first discovered, is employed in the production of aluminum. Most of the bauxite used in America comes from Arkansas and from Dutch Guiana. It first goes to a vast plant at East St. Louis, Ill., where the alumina is extracted. This white powder is shipped to refining centers in New York State, North Carolina, and Tennessee. Out of the electrolytic baths comes the pure aluminum. Approximately two pounds of alumina is required to produce one pound of metal. The electricity needed to produce that pound of aluminum would keep a forty-watt lamp burning continuously for twelve and a half days. In place of Greenland cryolite, a synthetic cryolite is now widely used at refining centers. The first plant that employed Hall’s cryolite method went into operation on Thanksgiving Day, 1888, at Pittsburgh, Pa. From it has grown the gigantic, sprawling battery of factories along the Allegheny River at “the aluminum city,” New Kensington, Pa.
As you go through these acres of buildings, you see electric furnaces towering forty feet in the air; steam chambers and gas-heated ovens aging alloys; great rollers reducing slabs of aluminum to silver-colored foil, .00035 of an inch thick. Rows of extrusion presses, fed billets of hot aluminum as a cannon is fed shells, force out streaming pipes and tubes. In fascinating, twenty-four-hour-a-day activity, the machines are transforming tons of the metal which Hall made plentiful into articles of utility and beauty. In fact, the use of aluminum has spread too rapidly for our vocabularies to keep step. We still call aluminum containers “tin cans”; we still refer to aluminum waffle molds as waffle “irons”; we still speak of “tin foil,” although most of it is made of aluminum. Probably the first commercial use of the lightweight metal in this country occurred in 1876 when a New York concern produced a surveyor’s transit made of aluminum. The transit was in constant use until 1909, when, still in good condition, it was placed in a museum. Watch fobs formed one of the early products turned out after the Hall process went into operation. Then came cooking utensils. So rapidly has this field expanded that more than 350,000,000 aluminum pots and pans have been made in the United States alone. One queer demand for aluminum came in 1906 when Walter Wellman, the arctic explorer, was grooming a dirigible for a flight to the North Pole. He had special aluminum boats shipped to Spitsbergen to carry on his airship for emergency use. Trouble at the Chicago stockyards, in 1897, gave aluminum another chance to demonstrate its value in an entirely new field. Locomotive gases at the yards corroded the copper telephone wires and produced frequent trouble at the switchboard. As an experiment, half a mile of aluminum wire was installed. It proved so satisfactory that its use spread. Today, there are more than 430,000 miles of aluminum cable in use, and a large part of the high-tension power lines of the country are formed of aluminum cables with steel cores added to increase their strength. Every year, millions of pounds of metal are reduced to a flaky powder to provide the pigment for aluminum paint. Twenty-seven states require it to be used on bridges and highways. Ships employ it as a weight saver. Tests have shown it has remarkable power to protect wood from moisture and ultra-violet rays. Laboratory tests at New Kensington revealed the secret of this power. When the paint is made, the metal particles are placed in a varnish base, about two pounds of aluminum in a gallon of the vehicle. Before the paint dries, the experimenters found, some of the little flakes of aluminum rise to the top and “leaf,” or overlap like shingles. The result is a thin skin of metal which protects the surface from sunlight and moisture. To aid in discovering new uses for aluminum as well as to learn new facts about its remarkable properties, about 100 scientists and technologists work in the huge, hilltop laboratory at New Kensington. During a recent visit to “the aluminum city,” I watched these men at work. A host of ingenious machines aids them. In one room, long rows of humming electric motors are pushing, pulling, twisting, vibrating tiny pieces of aluminum. Day after day, week after week, month after month, and even year after year, the punishment continues. By such fatigue tests, the scientists are learning more and more about aluminum and its alloys. As many as 40,000 specimens of aluminum are tested for tensile strength in a single year. One electric mechanism pushes and pulls on a strip of aluminum 1,800 times a minute, thirty times every second, day and night, until the metal breaks. Another reproduces the vibration of an airplane, and a third measures the “creep,” or elongation of the metal at high temperatures. Testing machines having screw threads made with watchmakers’ precision, can exert a pressure of 330,000 pounds. corrosion. And, an intricate laboratory mechanism constantly subjects aluminum specimens to load strains while an electric current passes through them. Humming, spinning, pounding, the research machines are always at work. So new is aluminum that the research men are still exploring its properties and possibilities. Besides general research, the laboratory tackles thousands of specific problems. A shaving-cream manufacturer wants to put his product in aluminum tubes. Will the cream corrode the metal? A manufacturer wants a container in which to ship a specific chemical. Is aluminum suitable? A packer desires to put sardines in aluminum cans. Will the metal keep the fish in good condition? In each case, only the laboratory can tell. Technologists set to work, make their tests, and give their report. Right now, they are grappling with the problem of producing alloys which will have greater strength at higher temperatures. This will facilitate the work of aircraft engineers in designing engines with more power per pound of weight. How much weight can be saved by substituting aluminum for steel wherever possible, was recently demonstrated when an aluminum Pullman car took to the rails. It weighed only half as much as the conventional sleeper. An interesting innovation in connection with alloys is the use of the spectroscope in determining the proportions of different metals in them. In one alloy, for example, a minute amount of cadmium is present. Measuring it by ordinary metallurgical methods is slow and difficult. By the new method, the scientist merely examines the alloy with the spectroscope and determines what metals are present by the position and intensity of the lines in the spectrum. One of the latest aluminum products which has resulted from research is a brilliant reflector. This reflector is now in use with sodium lamps on eastern highways. Experiments show it has almost as high reflectivity as silver and, at the same time, does not tarnish. TWO years ago, a report of the U. S. Bureau of Standards gave dramatic evidence of aluminum’s resistance to corrosion. The Government scientists examined the cap on the 555-foot Washington Monument. For nearly five decades, the little pyramid had withstood constant weathering. Yet they found its surfaces still able to reflect sunlight. Incidentally, the vast progress made in aluminum fabrication in fifty years is exemplified by comparing the 100-ounce cap of the monument, the largest aluminum casting in the world at the time it was made, and a 7,500-pound Diesel motor part cast recently. Additional resistance to corrosion is being given aluminum by an ingenious electrochemical process known as the anodic treatment. A very thin layer of oxide ordinarily protects the metal from weathering. By using the aluminum as the anode, or positive electrode, in the treatment, a heavy layer of oxide is added to its surface. By dyeing the oxide surface, aluminum in brilliant colors is now being produced and placed upon the market. A recent test proved that thin layers of aluminum foil would make an efficient heat insulator. Thirty pounds of foil, it was discovered, would insulate a truck body as effectively as 2,000 pounds of cork. Most metals are as old as history. Lead was used by the ancient Romans. Iron and copper go back to 3,000 years before the birth of Christ. But aluminum, in contrast, is a modern metal of the laboratory. Scientifically, it dates back only to 1825; commercially, to the 1880’s. Millions now living have witnessed virtually the whole of its dramatic rise. In five short decades, in the years since Charles Martin Hall came to the end of his quest in his back-yard laboratory in Oberlin, the aluminum age has become a reality. Aluminum drapes…. It is kind of silly, how demonstrating “new” materials tend to go overboard. Like with garments made from glass fiber in an article that Charlie put up a little while ago.